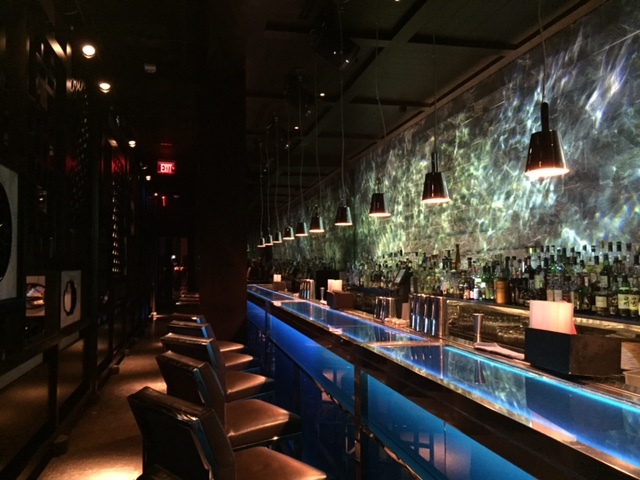 The last time I dined at Hakkasan was in 2009, the year it first opened at the ritzy Fountainebleu Hotel in Miami Beach. I remember the wonderful ambience and the courteous service, and yes the food was a delicious cornucopia of Cantonese cuisine. 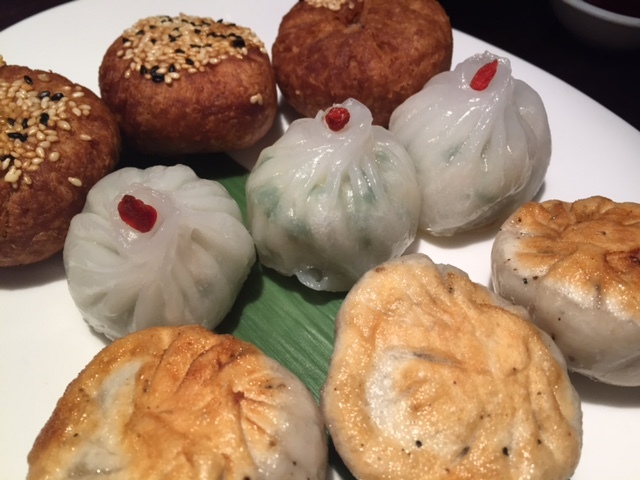 This time, Dim Sum brought me in on a cool sunday afternoon. I couldn’t resist a tempting price fix menu of $28 that included a sample of three steamed dumplings, three pan fried dumplings, one entrée, a choice of vegetables and a choice of *char sui cheung fun (bbq pork rice noodle roll), wild mushroom *cheung fung (rice noodle roll), spring onion egg fried rice, steamed jasmine rice or wonton noodle soup. Pork *shui mai (dumpling), a snap pea and shrimp dumpling and a Chinese chive prawn dumpling were the steamed offerings.While the chive and prawn dumpling was tender and flavorful, the pork one was chewy and tasteless. As a matter of fact, none of the meat dumplings were worth biting into, neither steamed nor pan fried, not even the deep fried chicken puff. For the main course you could choose from the BBQ platter, the smoked ribs and char sui (bbq pork) and the stir fried chicken. 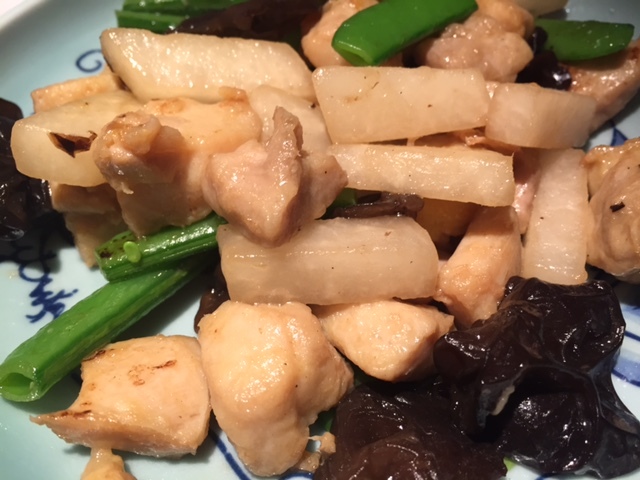 We all had to choose the same entrée so we picked the stir fry which was absolutely delicious; tender morsels of breast meat with mushrooms, crispy snap peas, and crunchy bits of Chinese yam. The only problem with this dish was its size. It was too small, more like an appetizer for three people. When asked if it was the right portion, the waitress replied ” that’s what the chef consider’s the right amount to be”. Ok, jut don’t call it an entrée! The scallion fried rice was light and fluffy. 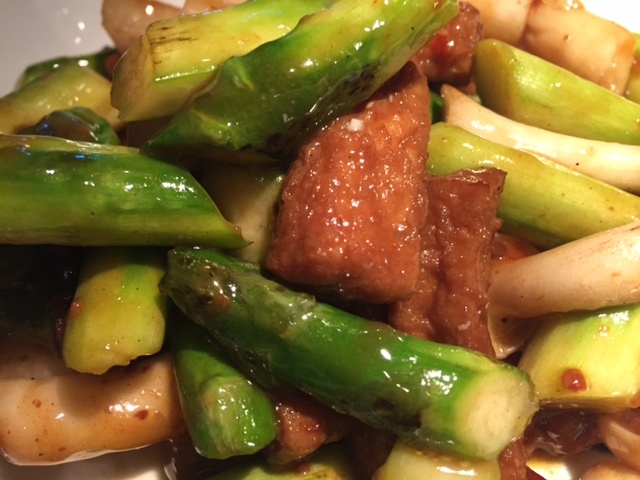 The vegetable side was a lovely medley of perfectly cooked asparagus and thin strips of fried tofu in a sweet Szechuan sauce, the best dish on this Dim Sum menu. Aside from the steep prices and the somewhat snooty staff, Hakassan’s ambience and decor are worth peeking into. Just make sure you order from the regular menu and hope the entrées will really be what they claim to be!